The fifth edition of North America’s premier international art fair, Art Basel Miami Beach (ABMB), debuted December 7-10. Art Basel Miami Beach is the extension of the elder, prestigious Art Basel art fair based in Basel, Switzerland. Art Basel initially planned to premier this event in December 2001 but the events of 9/11 caused the Swiss firm to scrap their plans and destroy the already-printed catalogs. Five years later, the fair is a booming art extravaganza with performances and art events for VIP’s and P’s alike. The fair has been hailed as the “Superbowl of art fairs” and declared a “permanent show” by Miami Beach Mayor David Dermer. With Art Chicago’s debacle a recent memory and its future somewhat mysterious, a declaration of art fair permanence must be met with some skepticism by anyone with a sense of history. 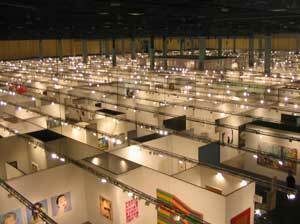 In the past, Art Chicago, which was one of the first international art fairs, was the art world’s destination. Each May, beginning in the 1980s, dealers and collectors would attend the Chicago International Art Exposition, which was held on the old Navy Pier. But a multitude of factors conspired to diminish Art Chicago’s importance in the nineties, leading to its ignominious sale last year to the Merchandise Mart, which runs more than 300 trade shows a year. Basel Miami, however, is booming, with nearly 180 galleries from around the world populating the Miami Beach Convention Center. The fair attracts nearly 40,000 visitors over its four-day run, including museum groups, curators, critics, collectors and art tourists. The hoopla created by the fair is legendary. Collectors have been rumored to dress up as janitors to get into the fair early and find the pieces they will bee-line to when the doors open to the public. The excitement spills over into multiple “side fairs” scattered around Miami in hotels, old churches and tents. Local art museums schedule special exhibitions, lectures and ritzy fund-raising parties. Several galleries even rent warehouse spaces to augment their selections at the fair. There are a number of major collectors in Miami, among them the Rubell family and Martin Marguilies; both featured in ArtNews’ Top 200 Art Collectors List, published last year. Both the Rubells and Martin Marguilies presented their collections to the public in museum-like warehouses. This year as part of a show of LA artists, “Red Eye,” the Rubells exhibited a number of large plaster sculptures by the British-born, LA transplant Thomas Houseago. The works present large, looming, gangly figures slapped together from plaster. The Rubells purchased the works several months before Basel Miami, prompting Houseago’s gallery, David Kordansky, to include more of Houseago’s sculptures to the fair. Large and important collectors such as the Rubells influence the value of an artwork simply by purchasing and displaying their acquisitions. This fact doesn’t escape gallerist David Kordansky either. The Art Newspaper reported that Kordanksy was “focused on placing Houseago’s sculptures … in prestigious collections.” Which would make Houseago’s sculptures more valuable yet, benefiting both Kordansky and Houseago. Wherever you turn at Art Basel Miami, you can see this type of fast-paced value creation taking place. This year there were thirteen side fairs that surrounded ABMB, and each one catered to a different area of the art market. Fairs such as “Pulse,” “Scope,” and “Aqua” presented new art from emerging galleries, but also included established galleries that weren’t able to enter the main fair. Basel Miami’s application process is highly competitive and galleries are judged by a panel based on the quality and reputation of the work that they offer. There are also specialty fairs such as Photo Miami, INK (printmedia) and DiVA (digital and video arts). The NADA (New Art Dealers Association) fair, which set up shop in an airy, Spanish-style church, had an excellent selection of high to mid-level galleries, and the smaller buildings made it less stressful to experience than the behemoth Basel Miami. Yet the side fairs wouldn’t exist without ABMB drawing collectors to Miami to provide a stable marketplace for business. ABMB’s affects on greater Miami are also evident; the Wynwood neighborhood boasts a thriving gallery and design scene, Miami art museums are building additions, and a new performing arts center was unveiled last summer. Again, Mayor Dermer was profuse in his praise of Basel Miami, “It’s taken us up the cultural mountain.” and “we are now at the pinnacle of culture in the world.” While such praise is probably exaggerated, the difference is noticeable. Longtime Miami resident and SAIC MFA student Alex Chitty said, “Since [the beginning of Art Basel] the attention paid to the arts, specifically fine arts, has nearly tripled. There are more galleries, more room for younger artists, and more opportunities to see work.” But for the other 51 weeks of the year, the effect on the Miami arts community is harder to quantify. Jeroen Nelemens, MFA in Fiber and Material Studies at SAIC, said that “the fair is more like a circus, it swoops in for a week and then it’s gone.” Some say Basel Miami’s positive effects adhere mainly to museums and galleries, with only a little left over for Miami artists. Naturally, the art fair format privileges certain types of artwork over others. Basel Miami’s booths are about the size of a one-bedroom apartment and usually have two to three continuous walls. The “Aqua” fair was deployed in the posh South Beach hotel of the same name. Each gallery occupied a room surrounding a central courtyard with palm trees and a Jacuzzi. The beds were removed from the rooms to make space for the art on display, and the bathrooms became improvised art storage. As a consequence of the less than ideal lighting and limited space, video installation and large sculpture took up too much room and were difficult to view. These restrictions tend to accommodate small painting, small sculpture and photography best. Plus, art fair crowds made up of collectors “on the hunt,” art tourists, and curators tend move fast in order to see everything; one look and then they’re done. Anything that requires much patience from a viewer is in trouble. David Weinstein of WPS1 MOMA’s radio station and the curator of Art Basel’s sound program agreed, “New media has always hard a hard time [being displayed], but art fairs are especially tough.” Weinstein’s solution for the Art Sound Lounge was to have his program available in headphones. Such compromises are routinely made in an art fair environment. "Natural selection amongst species of artworks and the reality that 50%-75% of all gallery sales now come from art fairs, makes it easy to understand why gallery owners have become anxious about the actual importance of the gallery show." Lisa Boyle of Lisa Boyle Gallery in Chicago said recently on art podcast Bad at Sports, “There are so many people from Chicago that I haven’t seen in my gallery that I’ve had come into my booth here [in Miami].” Even the big-boy galleries are changing their tactics. Heavy-hitting gallery owner Jeffery Deitch premiered new painter Ted Mineo at this year’s fair before ever giving him a solo show at his New York gallery, Deitch Projects. Bolstered by a feature article in the New York Times, all of Mineo’s paintings at Basel Miami were reportedly sold. Though it worked out this time for Mineo, the continued devaluation of a gallery’s regular exhibition program is alarming. Some galleries are bucking the mall-mentality, “one of everything on a wall” display and reclaiming their spaces for art. By and large, it’s the middle-weight galleries that are changing, because they need to generate publicity for their artists. The more established galleries have higher profile artists whose reputations sell their own artwork. Several galleries such as the artist-run Guild and Greyskhul (NY) at NADA and Susan Vielmetter (LA) at ABMB exhibited solo shows. Sara VanDerBeek, of Guild and Greyskhul remarked on why they preferred this type of presentation, “We’ve never really been happy with the group show style, and we’re trying to generate some interest for Stephen (G. Rhodes)’s show [in January].” More and more, galleries are trying to link their fair spaces to their exhibition programs. The always edgy gallery Gavin Brown only showed one piece in their booth, an installation by Urs Fischer. The piece left the booth largely empty except for a pack of Camel cigarettes that were suspended from a monofilament line attached to an arm on the ceiling. As the arm rotated the cigarettes slowly circulated around the floor as if caught by the wind. Such a concentrated presentation of artwork at a sprawling fair proved to be an effective tactic for both artist and gallery; the gallery can separate itself from the general chaos of the fair, and the art gets shown in the best possible light. If the trend toward focused presentations of art in an art fair context continues, and it will if the sales do, galleries would take more initiative over the design of their spaces, transforming the art fair into something akin to a biennial. In this possible future, each gallery presents their particular artist or curated group of artists in pavilions built to their own specifications. A show of this type would have all of the strengths of an art fair: physical proximity, short duration, conspicuous consumption, but the art would retain its aura, represent the artist’s practice more fairly, and allow for a better viewing environment for curators, critics and the wider art-loving public. for an in-depth look at Dan Gunn's experiences at Art Basel Miami Beach, see this month's Web Exclusive, More Miami Vices.